In Which World Are You? I had just turned on television, the NBC Tonight Show was on, and Johnny Carson was interviewing a movie star. And suddenly I thought, "Well, who else, pray tell, but a show business personality could Johnny Carson interview anyway?" Who else was of any importance, or would be considered of any importance to the viewing public, or of interest to the viewing public? That started a train of thought. I began to think how many different worlds there are, in this world. Show business is a world all unto itself. And then I thought, well, we talk about the "free world." We're all in the "free world," aren't we, over here, as distinguished from the communist world. And then we talk now about the Third World. As a young man, I was in the advertising profession, and there is an advertising world. And you know, I felt that every other world, and anyone in any other profession, was completely beneath us. We were above every other, we were more important than any other kind of profession or any other kind of occupation that anyone could be in. Now I began to think of other worlds, and how the same thing is true of most of them. Well, I thought of the Arab world; I've spent a good deal of time in the Arab world, and just recently I had an interview in Amman with King Hussein, who is prominent in the Arab world. Now in the Arab world, they don't know very much about any other world outside of the Arab world. They just know what's going on in the Arab world. And I thought how these different worlds have their own journals, their own newspapers; they speak their own language. Of course, the Arabs speak Arabic, and they have their language. And do you know, there are different languages, or shop talk, or whatever you want to call it, in almost every world of these different worlds that you can think of. Now I thought of the higher education world, the world of higher education, and they have a language all their own. They call it the language of scholarship. Well, then I thought of the sports world, and how that is divided into so many sub-worlds inside of the sports world. For example, baseball is a world all of its own, and then I thought of the football world, and the soccer world, and the basketball world, the tennis world, the golf world. They all have their own publications, their own journals, their own talk, their own kind of language. Then I thought of the labor world. And of course, the labor world is above all worlds. Then the business world. Whatever world you're in, you're superior to all of the others. Then the political world: those in politics are a world unto themselves, a separate world altogether. Then the professional world: doctors, dentists, architects, and so on. And of course, they are superior, too, to everybody else in their own estimation. Then the world of science. I don't know if there's any world that is more lofty and above other worlds than the world of science, tell me what it is. That, of course, is a very superior world. And then we have the religious world, and think of all the religions all over this world. Now of course the biggest religion is called Christianity, and even that is subdivided. The religious world is subdivided into many different worlds. Christianity is subdivided into the Roman Catholic world, the various Protestant worlds, and the, there are hundreds of Protestant denominations, all subdivided. And all are part of this world! Even the religious worlds are part of this world. Now I'd like to have you take a little look for a few moments at this world and its many subdivisions. There are some things that are typical in this world, all of us are a part of it, and there is something in common in all parts of the world, although it is in competition against itself. And there's competition in every walk of life. I suppose that most people just take it for granted that this is God's world. You've heard of the doctrine, the fatherhood of God, and the brotherhood of man. Well, that Bible won't back that up. That's contrary to God himself, who is speaking through the Bible, and God's message to man. It simply is not true. But there is a god of this world, and they are, perhaps, more right than I might have said just a second ago. When you stop and think about it, there is a god of this world, and most of them are in his world. Let me read it to you. It's in II Corinthians the 4th chapter, and verses 3 and 4 (II Corinthians 4:3-4). "But if our gospel be hid, it is hid from them that are lost, in whom the god of this world hath blinded the minds of them which believe not, lest the light of the glorious gospel of Christ, who is the image of God, should shine unto them." Do you ever stop to think that, if you're in a dark room and a bright light suddenly shines, it'll just suddenly blind you, and it hurts your eyes? It really hurts your eyes for awhile. "And the bright light of the truth of the gospel of Jesus Christ." Now that's a gospel that has not been proclaimed to the world for 18½ centuries, until it began to be proclaimed on this particular program. "The god of this world hath blinded the minds of them that believe not the real gospel of Christ." Well, they're not blinded because the gospel of Christ hasn't been preached to them, and perhaps it would blind them. Now just what was the gospel of Christ? You've been hearing a gospel, but it's the gospel of men about the person of Christ. Now the gospel of Christ is the gospel Christ himself proclaimed, the gospel he brought from God Almighty. God the Father sent a message to me. Jesus Christ was a messenger bringing a message. And the message is the gospel, not the man who brought it, not the messenger. Men are preaching about the messenger, not his message. It's in Mark the 1st chapter (Mark 1:1): "The beginning of the gospel of Jesus Christ," not about Christ, but of Christ, "the son of God." Then it talks about John the Baptist preparing a way before his coming and his gospel. And then coming to verse 14 (Mark 1:14): "Now after that John was put in prison, Jesus came into Galilee, preaching the gospel." Now what gospel? Not just telling people about himself. That's what they're doing today, telling people about Christ. He didn't come, just telling them about himself, and saying, "I want you to know all about me." Now, he came preaching the gospel of the kingdom of God, and saying, "The time is fulfilled, and the kingdom of God is at hand. Repent ye, and believe the gospel." Now, the time was fulfilled. It had not been fulfilled until that time, and just two verses ahead of that, it tells how he had conquered Satan the devil, who had tempted him in the most titanic battle that has ever been fought in the history of all mankind. And Jesus had won that battle, and he wound up by telling Satan to leave, and get out of there. And Satan slunk away, and did obey. And Christ, Satan was sitting on the throne of this Earth — he is the god of this world that has deceived people. He was the god of this world! Now Christ had conquered him and qualified to become the god of this world. The first Adam, who had been created, failed in that assignment. But Jesus Christ came, the second Adam, and succeeded. And he proclaimed the gospel. The word "gospel" means "good news." Now, it's news, it's not "olds," it's not something that happened yesterday or the day before, or a thousand years ago, that's old and isn't new any longer. It was news because it was advance news, it was a prophecy for the future — the kingdom of God. It had not come yet. He came to proclaim that it would come. The kingdom of God — what do we mean, the kingdom of God? Anyway, notice he said do two things. Repent — that means turn around from the way you're living, and go the other way. Turn around from the way you've been believing, and what you believe, and come to the truth, and believe that. Now what is a kingdom? Jesus came preaching the good news of the coming kingdom of God. This will be God's kingdom, but what is a kingdom? The prophet Daniel was explaining this to the first emperor of all this world. We have different nations in the world, and the first time the different nations had been assembled into one single empire, including a number of nations, was the Chaldean Empire. And King Nebuchadnezzar sat on the throne of that empire. He had gotten it together. And we read of him back in the 2nd chapter of the book of Daniel (Daniel 2:28). And I want you to notice now in verse 28, where Daniel was called before the king. He had dreamed a dream, and he couldn't remember what it was. And he demanded to know, and no one could tell him, but Daniel had prayed, and God revealed it to him. And Daniel came before the king, and Daniel said, verse 28 here, Daniel the 2nd chapter (Daniel 2:28): "But there is a God in heaven that revealeth secrets, and maketh known to the king Nebuchadnezzar what shall be in the latter days," long, long into the future — what was going to happen. Actually, he was talking about our time now. We're in the latter days today. Now, he came to the explanation finally in the 44th verse (Daniel 2:44). The king had seen a great vision, or a dream, of a great image, and the king himself was the head of gold, and there was a succession of time element in it. After him was to come the breast and arms of silver that was to be the Persian Empire, and after that the belly and thighs of brass that was to be the Greco-Macedonian Empire, and then a fourth great empire, the Roman Empire, the legs of iron, and finally the feet and the toes, resurrections of the Roman Empire getting down into our time now, and we're waiting right now for a resurrection of what was known as the Holy Roman Empire of the Middle Ages, after the original Roman Empire had fallen. Now in verse 44 (Daniel 2:44), Daniel said: "And in the days of these kings," that is, kings that are coming into being right now, and have not yet appeared, that are coming in our time. You'll be reading of it in your newspapers. "And in the days of these kings shall the God of heaven set up a kingdom which shall never be destroyed, and the kingdom shall not be left for other people, but it shall break in pieces and consume all these kingdoms, and it shall stand forever." In other words, he's talking about the governments of this world, and he's talking specifically there about governments that would occur in Europe and eastern Europe, western and eastern Europe in our time now today. And the God of heaven is going to set up a kingdom, and that kingdom is going to take over all the kingdoms, or nations, or governments, on this Earth. That includes the United States, that includes Britain, that includes France and Germany. That includes Japan, China, Russia, all the nations of this world, every last one of them. You read of it again back in Revelation the 11th chapter. I'm just hitting a few high spots right now. Revelation 11, and in verse 15 (Revelation 11:15): "The kingdoms of this world are become..." This is a prophecy, it hasn't happened yet, it will. When the kingdoms of this world shall have "become the kingdoms of our Lord, and his Christ, and he shall reign forever and ever." A kingdom, a government, that will rule all the nations of the Earth! How many people know that Jesus Christ was born to be a king? That the prophecies of the Old Testament said he would come as a king, and be born as a baby, he would grow up, he would be rejected of men, and yet he would come to be a king? And when he was crucified, they nailed over his cross, "This is Jesus of Nazareth, the King of the Jews." But he was not just king of the Jews, he is coming to be king over all nations of the Earth. And they misunderstood. He didn't come to be king the first time. He's coming again for that purpose, another time later. Now this world, to understand it, you need to know how this world began. What was the foundation of this world? I want you to notice something about it. It began back in Genesis the 1st chapter (Genesis 1:1), and it starts here with creation. "In the beginning, God," or Elohim, which is more than one person, but one God, just like a family name. A family — more than one person, but one family. Church — more than one person, a lot of people in a church, but one church. "God created the heavens and the Earth." And then finally, God said, in verse 26, after he had created animals, each after its own kind, cattle after the cattle kind, dog after the dog kind, and elephants after the elephant kind, God said, verse 26 (Genesis 1:26): "Let us," not me, but "let us," more than one person, "make man in our image, after our likeness," after the God-kind. Man was made after the God-kind. And God's purpose was to reproduce himself and God is supreme, perfect, righteous character, spiritual character. And that's what he intends to make out of mankind. But the way God created man, you read in the 2nd chapter and verse 7 of Genesis (Genesis 2:7): "And God formed man of the dust of the ground, and breathed into his nostrils the breath of life, and man made of the dust of the ground, became a living soul." The dust of the ground became a soul. A soul is not spiritual, and a soul is mortal. But there is a spirit in the soul, or in man. And that soul is in the brain, and in the mind, and imparts, imparts the power of intellect to a physical, human brain. A human brain is no better than an animal brain, no better than a cow's brain, an elephants' brain, and not anywhere near as large as an elephant's brain. Yet a human brain can think, a human brain can have knowledge that an elephant can't have. And a human can design things, and plan things, and make decisions, can have a love for art and music, and things of that sort, and has the power of will, and things that are never given to any animal. And that all comes from the spirit in man. Now God put a human spirit in man, but man was made incomplete. God made just one man first, and then man was incomplete, because man intended man to reproduce himself. And God is reproducing himself, and he's reproducing many people so that God can reproduce many of them into his children, and to become his children. Oh, how the world has been deceived from these basic truths that is in your Bible from Genesis to Revelation! So, man was made with animal existence, but he's made with a mind something like God's, and yet it is not like God's, because it was only half there. Now the man was incomplete, he couldn't reproduce himself. I never saw a man who could reproduce and have children all by himself yet. So God made a wife for him. He made the man first, he made the wife afterward. Then the man was humanly complete. But he was not mentally complete. He only had half a mind, he had a human spirit. But he needed another spirit with it, just like he is a male, needed a female with him. Now he needed the God spirit to mix with his spirit, so he could be begotten of God, and later born of God. Now God didn't make the first Adam like that, but he freely offered Adam that in the Tree of Life that was in the Garden of Eden. You've heard of the incident of the forbidden fruit. Well, there were two trees in the Garden of Eden. One was the Tree of Life; the other was the Tree of the Knowledge of Good and Evil. But if they ate of the Tree of the Knowledge of Good and Evil, God said, "You will surely die." So that was a tree of death. That was a tree of death; the other was a tree of life. Well, one was a tree of knowledge, the other was a tree of knowledge also, but it was God-revealed knowledge. And also, the mind of man, through the human spirit in man, imparts to man more than just a thinking process or a process of acquiring knowledge, material knowledge. Man can acquire material knowledge; he was made to have the ability to do that all by himself. But there's something else. He was made also to acquire an attitude — that is, either an attitude of love and cooperation, and that type of attitude, or an attitude of rebellion, an attitude of hostility, of competition. Either one of humility or one of vanity. And it is the attitude in people through this human spirit, that accounts for all of the troubles in the world. That's why people don't get along together. That's why one person doesn't get along with another. His spirit clashes with the spirit, or attitude, in the other person. It's, it can be an attitude of jealousy, of envy, of competition, of some kind of rebellion, of hate, of anger; or it can be an attitude of love and cooperation. Now God is the supreme God, and the great giver of all, the giver of life, and God's attitude is that of love. God is the great God of love, and he loves everybody. "God so loved all the world," everybody including you and me, "that he gave his only begotten son that whosoever believeth on him should not..." What? Should not perish. It doesn't say, "Should not go to hell and burn forever." It said, "Should not perish." When you perish, it's just as if you'd never been in the first place. The Bible talks about those that finally perish as being ashes under the soles of the feet of the others, if you'd read your Bible instead of believing a lot of fairy tales that have been taught around for too many thousands of years. And so, we find that Adam made the wrong choice. And he chose to go it all by himself, and depend on his own spirit, and acquire his own attitude. But there was this god of this world, Satan the devil, and he got to Adam through his wife Eve. And they rejected the way of God. They rejected the love of God, they rejected the law of God, and sin is the transgression of the law of God. You read that in I John 3, and verse 4 in your Bible. I John 3, and verse 4 (I John 3:4) "Sin is the transgression of the law." They transgressed that law, and that law did exist in Adam's time, or he couldn't have sinned. (I Corinthians 15:22) "But as in Adam, all sinned." And "in Adam, all die, so in Christ shall the same all be made alive, even yet." Now then, God closed up the Tree of Life, and the Tree of Life, the spirit of God, the Holy Spirit of God that would come and dwell with man and impart to man immortal life, God life, has been denied to mankind until Christ came, the second Adam. (I Corinthians 15:22) "And so it became appointed for men once to die, and after this the judgment. And as in Adam all die, so in Christ shall all be made alive." Jesus came and founded his church with twelve disciples that he taught. A disciple is a student. He taught them for 3½ years. Then he commissioned them to go out and to teach others, baptizing them, but as many as God should call. On the day of Pentecost, the apostle Peter said, (Acts 2:38-39) "Repent, and be baptized every one of you in the name of Jesus Christ, and you shall receive the gift of the Holy Spirit, for the promise is unto you and unto your children, and them that are afar off, even as many as..." What? "As many as the Lord our God shall call." Jesus Christ said, (John 6:65) "No man can come to me, except the Father which sent me draws him." I don't have time to go into all of that, but I want to tell you that there is so much of this in the Bible. The Bible has not been understood. It is the revelation from God to man. It reveals things that are a mystery to man, but they're plain enough in the Bible, if you'll only read the Bible. But people have been hearing things just exactly contrary to the Bible, and yet supposed to come from the Bible, but they don't. If you open the Bible and read it for yourself, you will find out. I'd like to send you a booklet that I wrote not too long ago: Never Before Understood, what this world has not understood. It is not understood in the churches. It is not understood by science, it is not understood in any college or university — why humanity cannot solve its problems and its evils. I've talked with heads of state all over the world. They have problems way beyond their ability to solve. They cannot solve their problems, because the problems are too great, and humanity can't solve them. Why can't we? The reason has never been understood. This is a beautiful booklet. It's well-illustrated, and there's no charge. And I'd just like to send it to you: Never Before Understood. I'd like to have you call in right now, or go to the telephone and call in. Then, the Plain Truth Magazine. I'd like to have you get this magazine. By the way, a great deal of what I've said, and a whole lot more, too, is in my own editorial in this issue: "In Which World Do You Live?" That is my editorial in this issue. Then, "Jordan's King Hussein — Searching for Peace." And another article: "Why No Subscription Price to the Plain Truth?" There's no subscription price, and no follow-up or request for money. And I don't know of any program like that anywhere, except this one. And another article: "Is There a Hell?" Another one: "Coming Soon: A World with Job Security." That's going to come pretty soon, well, there'll be job security. There is no problem greater right now than unemployment, and many of you are unemployed. There will be a time coming. Then the main article here: "Humanity Won't End with a Nuclear Holocaust." It won't end. And that is the picture of a hydrogen bomb on the front cover of the Plain Truth magazine. I'd like to send it to you, and there's no request for money, and it's gratis. 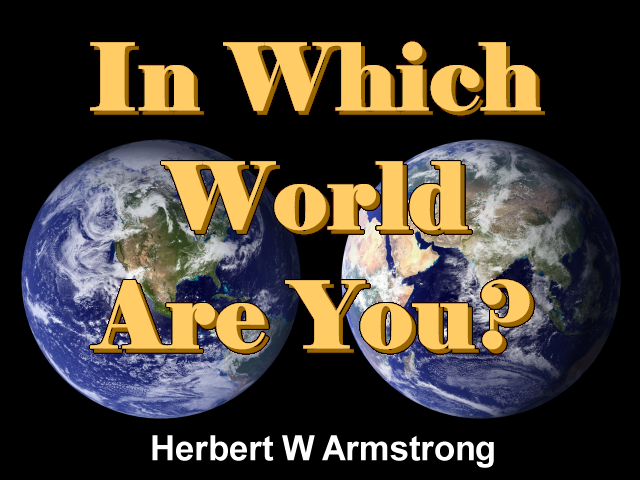 You just send your request to me, Herbert W. Armstrong, Pasadena, California. That's the only mail address you need. Herbert W. Armstrong, Pasadena, California, 91123. Or, why don't you just go to the telephone, right now, and telephone? It's a free call. And you call 800-423-4444. That is 800-423-4444. Now if you're in California, Alaska, or Hawaii, then call collect: area code 213, collect, 577-5555. Now that's area code 213-577-5555. So until next time, Herbert W. Armstrong, goodbye friends. Please Note: The FREE literature offered on this program are no longer available through the Address and Phone Number given, please visit www.hwalibrary.com for all FREE literature offered on this program.